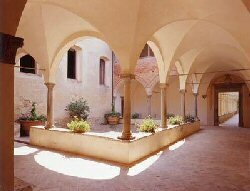 Welcome to the homepage of the Siena 2005 School of Crystallographic Computing, which will be run at the Certosa di Pontignano, 10 km outside the town of Siena, in Tuscany, Italy. The school organisers are extremely appreciative of the generous support from the University of Siena in providing such facilities. Even with an expected high ratio of speakers to students, we hope to keep the registration and accomodation costs at a reasonable level for school participants (below 500 Euros). The organisation has been optimised to make it easy for participants to make the one hour trip to the 20th IUCr Congress in Florence that starts just as this school finishes. Without crystallographic computing, the CCD and the diffractometer are for naught! Without the software programs that computational crystallographers create, irrespective of the amount of diffraction data collected, structures "will not solve, will not refine and will not validate!". With this in mind, the aim of the school is to have the crystallographic computing experts of the present, help train and inspire a new generation of experts in crystallographic computing. This will be achieved by the use of an excellent (and full) program of lectures, workshops and projects. 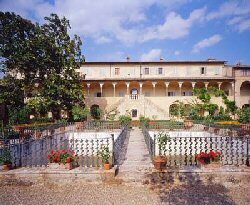 With its origins as a 14th century monastery, the Certosa di Pontignano provides a wonderful environment for teachers and students alike. It is now run by the University of Siena. 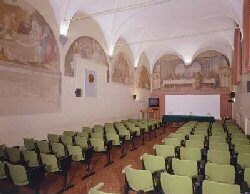 Attractively placed on the top of a hill, it is surrounded by vineyards; with a direct view to the town of Siena, and a famous Chianti winery We hope to have a productive school worth remembering both for its scientific lectures, its teaching content, and its surroundings. While the scientific program is busy, one must not forget the body (or the mind would wither!). Food to grow the crystallographic soul will be prepared and served by an ensemble of the top computational crystallographers in the world. Food for the body can be expected with the best cuisine and wine of the local Chianti countryside. 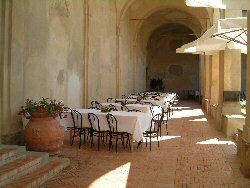 Breakfast is included in the Certosa di Pontignano accommodation costs. All lunches and dinners are included in the registration costs.